Waaaaah! I miss my blog. I've been stupid busy lately and haven't had time to blog or even keep up with other people's blogs. (Not sure how long Neil practiced to get those dance moves down pat but its truly an awesome spectacle to behold). The whole 'Scopitone' thing is something new to me and deserves a post of its own. 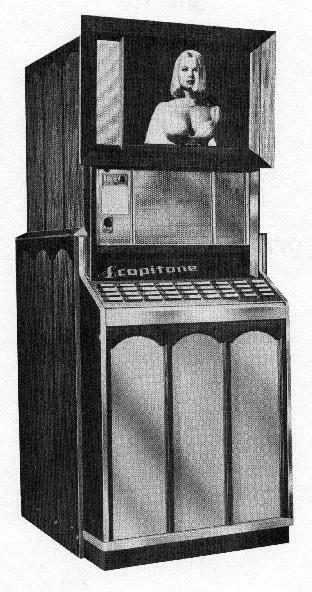 If you can't wait, you can find out a little bit about them at the Scopitone Archive (which, by the way is also the source of the scopitone pic above). Hope to be back with you all soon. I remember when that song came out! So uplifting it was and turned into a real hit. Thanks for this. I had to watch that twice to take it all in. Nice moves Neil and Calendar Girls. Came back to check it out again - I was thinking Neil's moves were a kind of skiing motion but it's more of a flick of the wrist. NS rules. Np. Hope you're less crazed soon. The blogosphere misses your uniqueness.